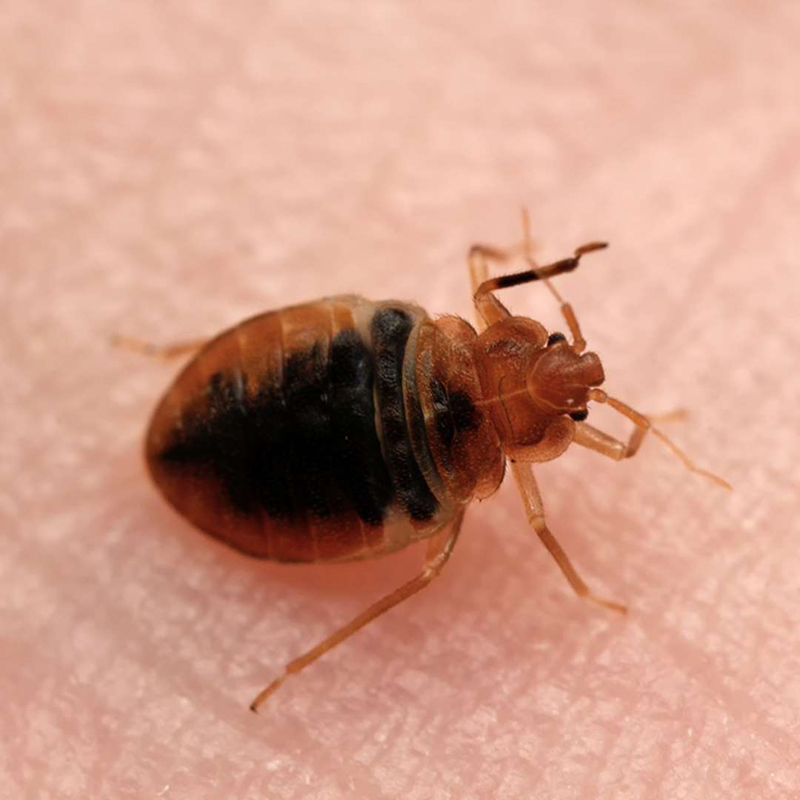 Bed bugs don't like being jostled, so they avoid hanging out in your hair or clothes, but they do like to stay close to their food source, namely you. The mattress is the first place you should inspect if you're trying to figure out how to get rid of bed bugs fast. Bed bugs love to hang out in cracks and crevices. They can fit into any gap the thickness of a business card. One of their favorite spots is the piping along the edge of a mattress. Look for the bugs themselves, their dark droppings, your dried blood, eggs and gold-colored shells that have been left behind after molting. Perform a quick inspection of the upper piping every time you change your sheets. Make a more thorough examination by folding the piping over and closely inspecting both sides all the way around, top and bottom. 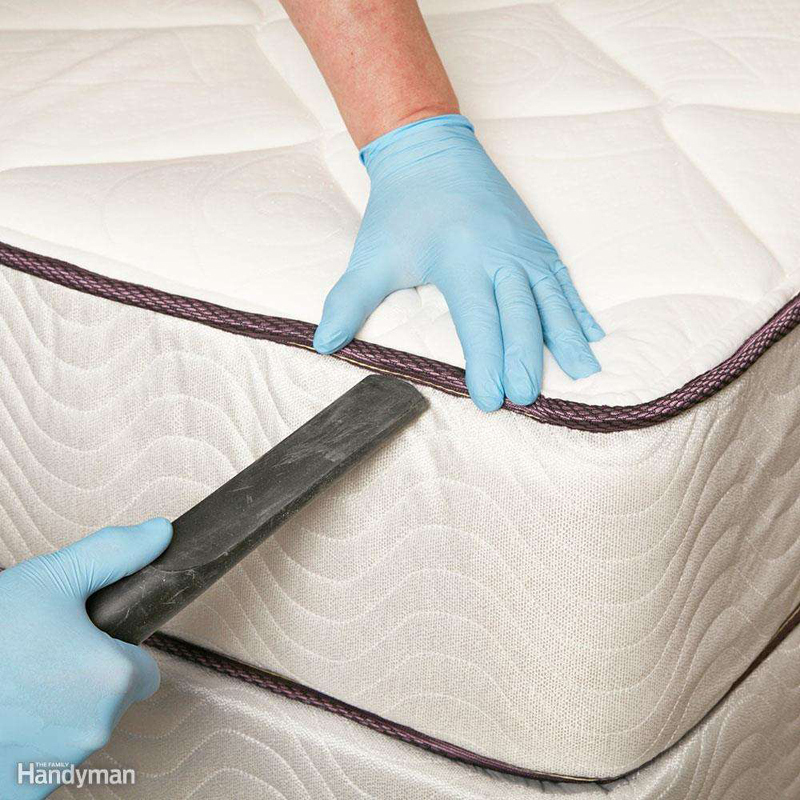 Do this a couple times a year or every time you flip or rotate your mattress. If you spot any signs, keep reading to learn how to get rid of bed bugs. Traps aren't an effective way to wipe out a bed bug infestation, but they're an excellent way to determine whether you have them. 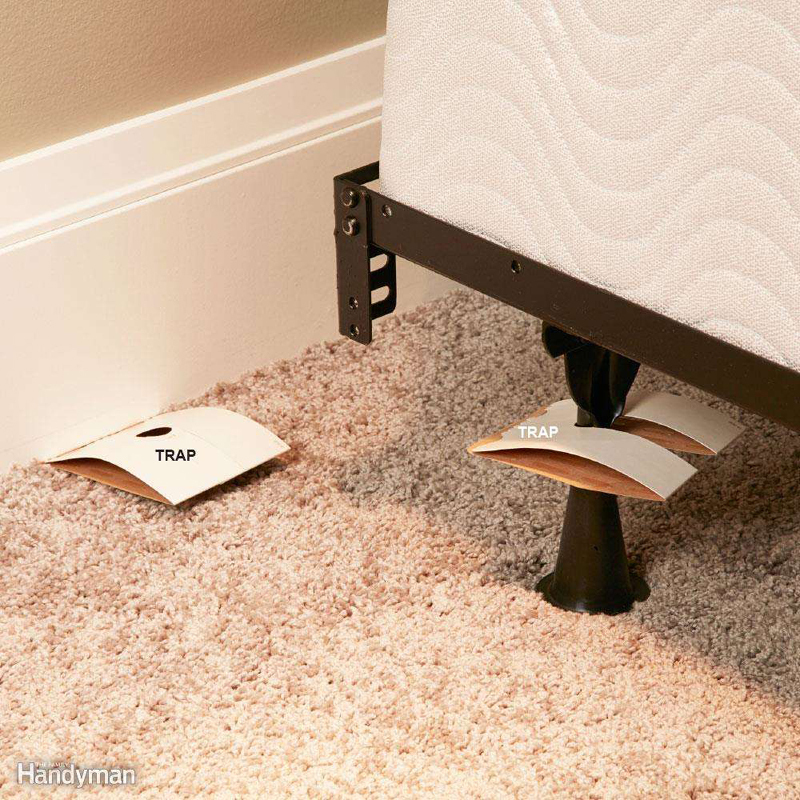 Set traps in areas where they may hide or travel, like near baseboard trim or under nightstands. If they aren't living in your mattress or other parts of your bed, that means they need to travel up the legs of the bed frame to get to you, so place traps there as well. 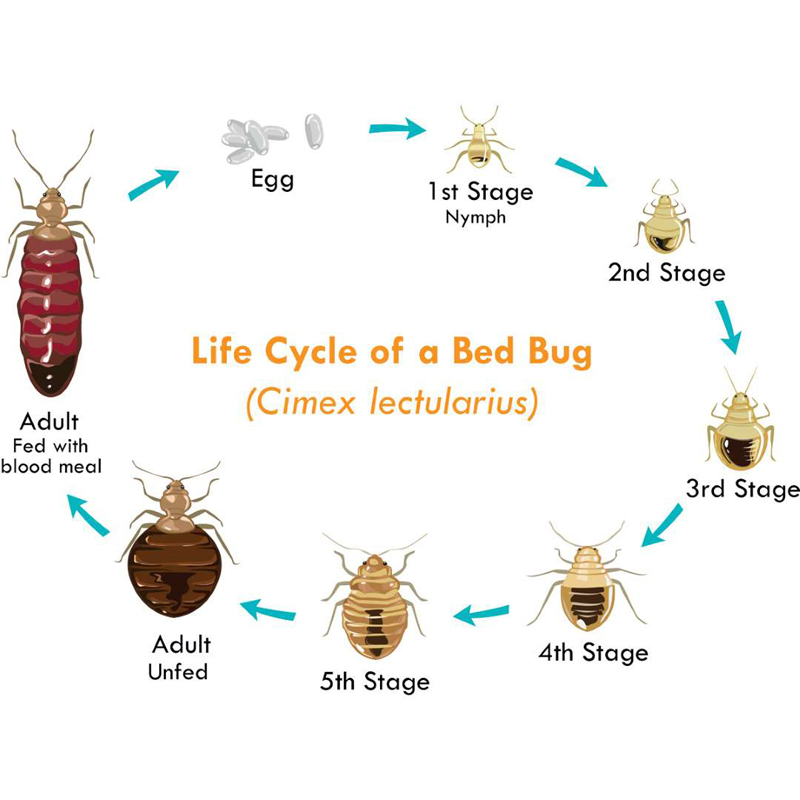 If you confirm you have bed bugs in one bedroom of the house, one of the ways to get rid of bed bugs is you'll have to treat that entire room, but you won't necessarily need to treat the entire house. Set up traps to monitor other bedrooms and living areas to make sure they stay bug free. These Hot Shot traps are available at The Home Depot. Bed bugs love fast food. They like to feed and then scurry back to their hiding places. They try to avoid crawling all over their food for fear of waking it/us. They usually bite the bare skin they find closest to the mattress. That's why it's common to see two or three bite marks in a line along the skin that was in contact with the mattress or pillow. When this happens it's time to learn how to get rid of bug beds fast. Everyone reacts differently to a bed bug bite. 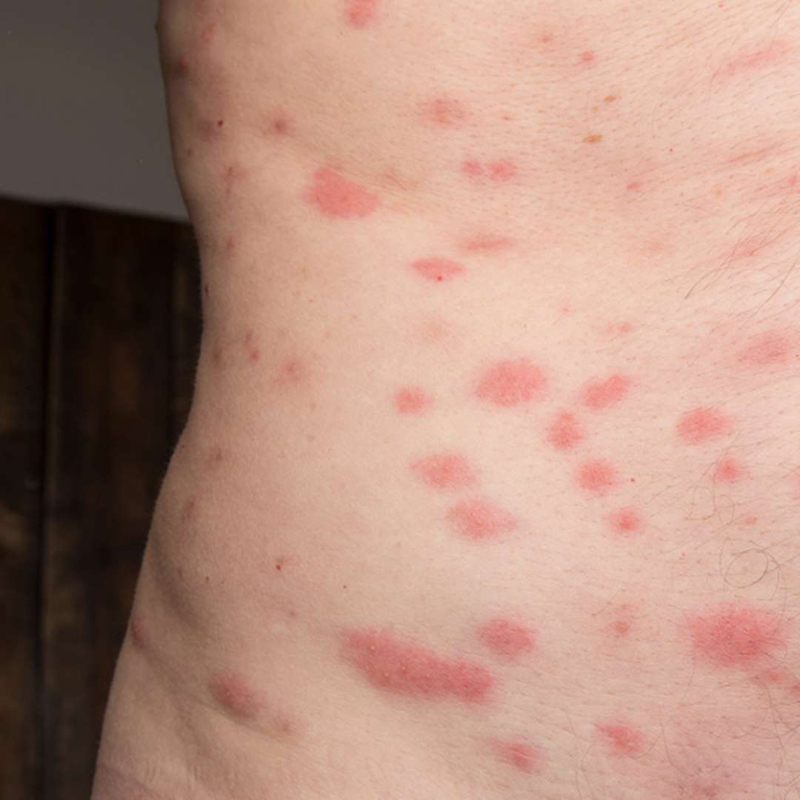 Some will develop small itchy bumps like mosquito bites; others will suffer from large, puffy red lesions the size of a quarter. A lucky few will have no reaction at all. Other signs of bed bugs are bloodstains on your sheets, pillows and blankets. Are you scratching yet? A fully fed adult bed bug is about the size and shape of an apple seed. An unfed bed bug is more round and flat like a tick. Newly hatched bed bugs are the size of a poppy seed and are golden in color. Their eggs look like small grains of white rice, about 1 mm in length (sorry for all the food references). 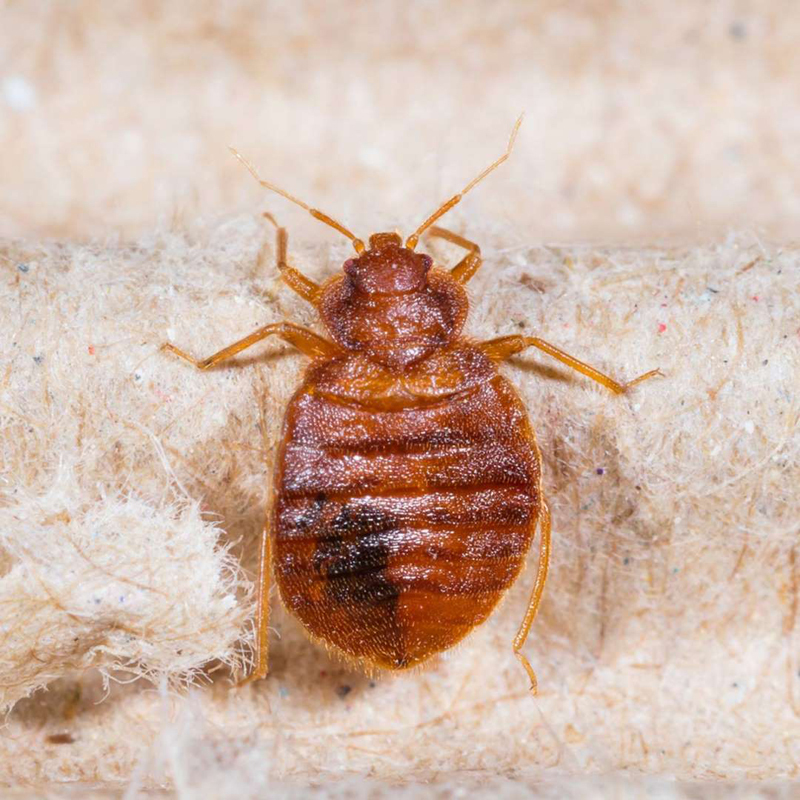 If you find what you think might be a bed bug, take it to the entomology department of the nearest university or to a pest control company for official identification. Your bed bugs may be migrating from your neighbor's place. Call your property management company. Insist they inspect the apartments on either side, above and below to figure out the fastest way to get rid of bed bugs for good. Hiring a pro to wipe out bed bugs isn't cheap. Expect to pay about $200 per room to kill bed bugs, and you'll likely need a few chemical treatments in order to eradicate bed bugs. Professional heat treatments will cost even more. And even if you hire a pro, you'll still have to do lots of work yourself (moving furniture, washing all clothes, etc.). So consider declaring a DIY war on bed bugs. If you're willing to spend $100 to $200 and do things right, your chances of success are excellent. When working with chemicals, always read the directions. You should be able to stay in the room during the treatment process. Room treatments entail thorough cleaning and applying chemicals. The process needs to be repeated three times, two weeks apart. The first thing to do after confirming an infestation is to bag up all your clothes, towels, bedding and curtains in plastic bags. Tie tight knots to seal the bags and keep them tied until they reach the washing machine. Wash with hot water and dry thoroughly. Temperatures over 120 degrees F will kill bed bugs and any eggs they've left behind. Store clean clothes in another room until you've finished treating the infested room. If you plan to take laundry to a professional cleaner or public laundry, treat it chemically first to avoid spreading the bugs. Now that all the stuff is out of the bedroom, it's time to treat the room itself. The first step is to vacuum every surface in the room, the baseboards, all the furniture, the mattress, box spring, bed frame, everything. 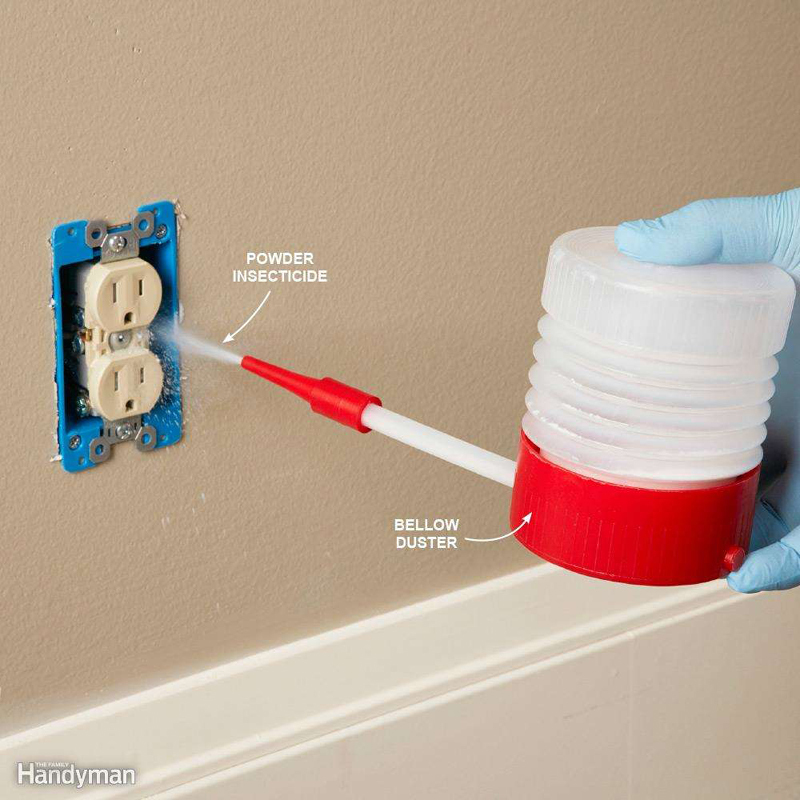 Use a small wand to get into all the corners and crevices. When you finish, throw out the vacuum bag to avoid spreading the bugs. 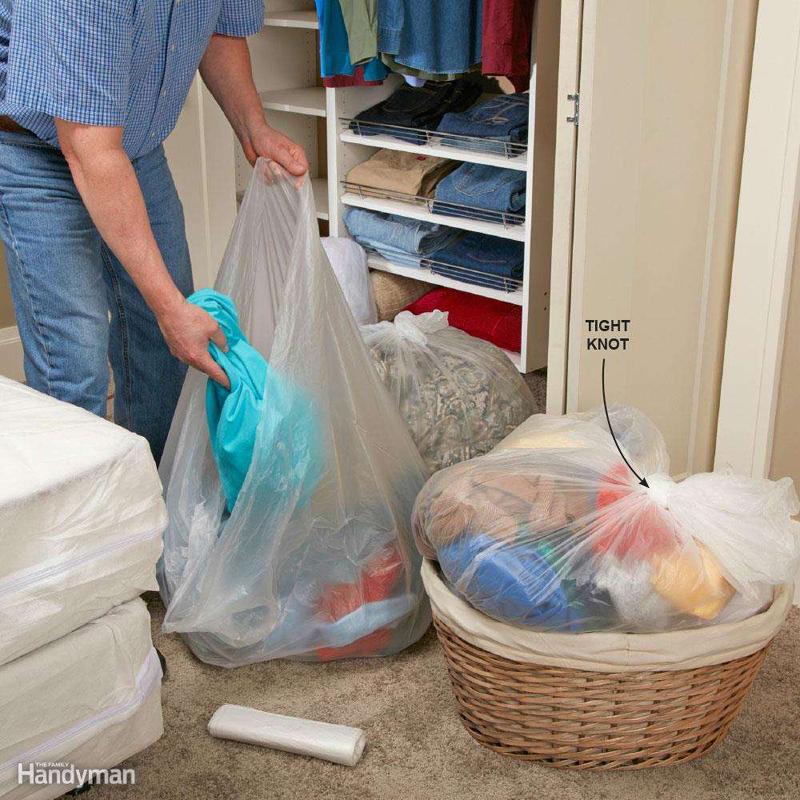 If you use a shop vacuum or bagless vacuum, dump the contents you've collected into a bag, tie it up, and throw it out. And treat the filter and the inside of the canister with contact spray insecticide. Flat surfaces like walls and dresser tops can be wiped with alcohol. Wipe a small inconspicuous area first to see if the alcohol will damage the paint or finish. What's the best way to get rid of bed bugs? Stop feeding them. 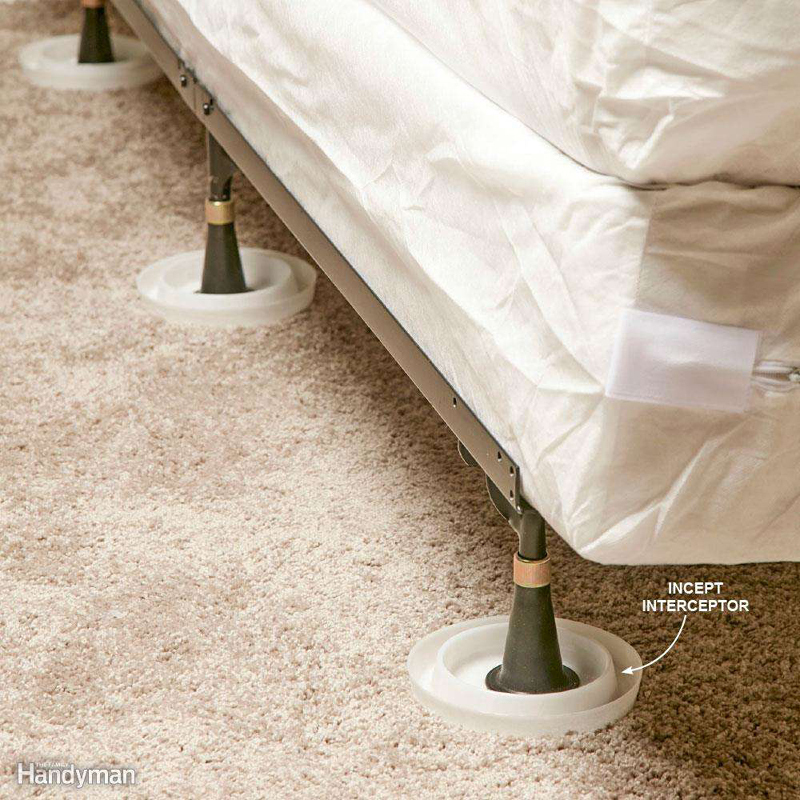 To prevent those unwanted dinner guests, isolate your mattress from the rest of the room. Start by pulling the bed away from the wall and away from other furniture like nightstands and chairs. Remove box spring skirting that hangs down to the floor. Oversize blankets that drape to the floor can also act as a ladder for the little buggers. Finally, place all the legs into insect interceptors like these made by ClimbUp. They allow bugs to climb into the outer pitfall area, but the slick plastic coated with talcum powder keeps them from climbing out or reaching the center well and climbing up your bed frame leg. Spray insecticide on all the areas where you've seen signs of the bugs or the bugs themselves. And spray all the areas where they're likely to hide, like the furniture near the bed, the entire bed itself and the perimeter of the walls near the baseboard. Most sprays are contact killers, which means they kill only the bugs and eggs they touch directly, so there's no reason to spray all the walls, ceiling and the entire floor. Spray pesticides are available online and at home centers and hardware and discount stores. Many brands kill other insects, like fleas and roaches, as well. 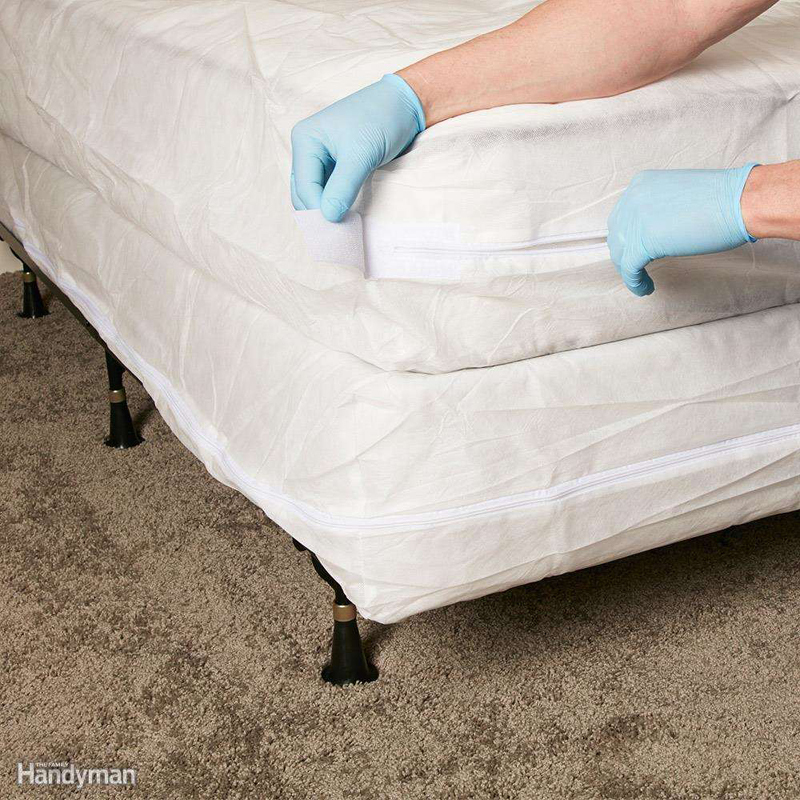 Once you've vacuumed and chemically treated your mattress and box spring, enclose them in encasement bags. If the bed bugs found a way inside the mattress, the odds are that the spray chemicals did not kill them. 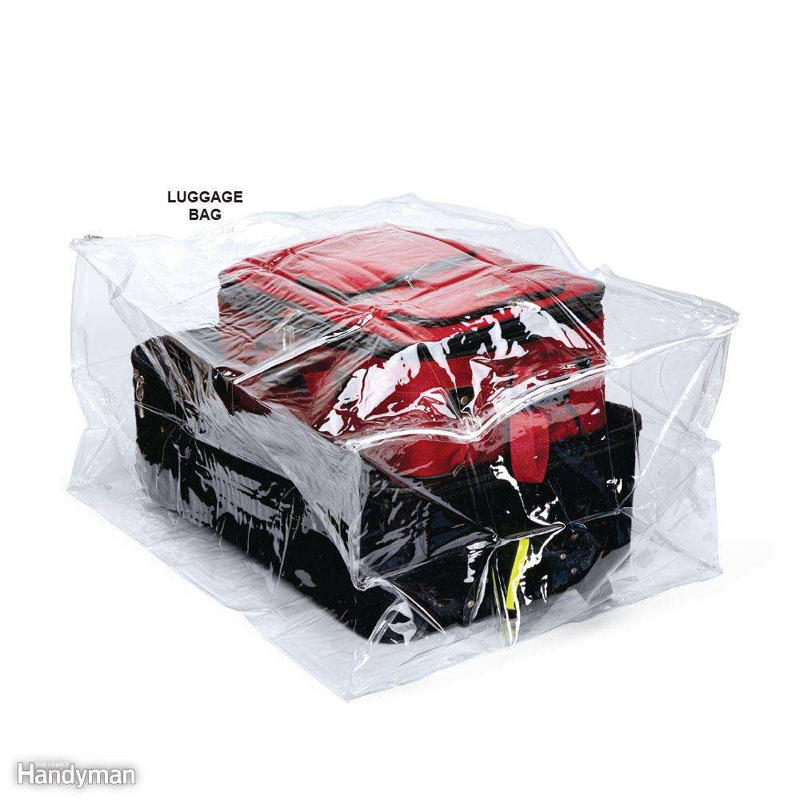 Encasement bags have special zippers that trap the bed bugs and prevent them from escaping. Keep these bags on for at least a year because a fully fed bed bug can live more than 10 months between meals. If the idea of sleeping on a tiny bed bug cemetery is too much to bear, the only alternative is to toss the mattress and box spring and buy new ones. Just be sure to wrap up the infested one before hauling it through your house, and don't buy a used mattress! It's not likely that you'll kill all the bed bugs with a bed bug spray. That's where a residual powder insecticide comes into play. It kills any bugs that wander through the powder. Some powders can kill bugs for many years if left undisturbed. 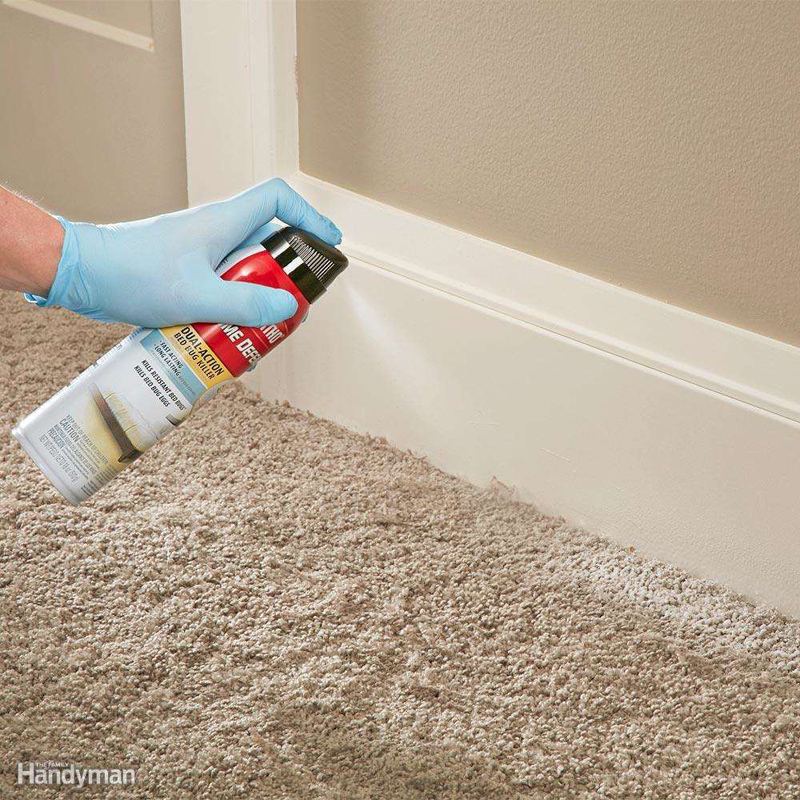 Skip the open areas and spray the powder in those places where you think they'll be traveling to and from, like near bed legs and under baseboard trim. If at all possible, pull up the carpet where it meets the wall and puff powder around the whole perimeter of the room. Inside outlet boxes is a great place to use powders because sprays and electricity don't mix. Bellow dusters work great for spreading residual insecticide powder. An old makeup brush is a good tool to spread the dust around on hard surfaces. Bed bug powders are available the same places you'll find the spray pesticides. OK, you've dealt with your room, clothes and bedding—now it's time to deal with your stuff. Everything in the bedroom needs to be treated: every book, shoe, lamp, photo, power strip, alarm clock, magazine, every knickknack and bric-a-brac…everything! If you don't treat it, bag it, tie it up and throw it out. 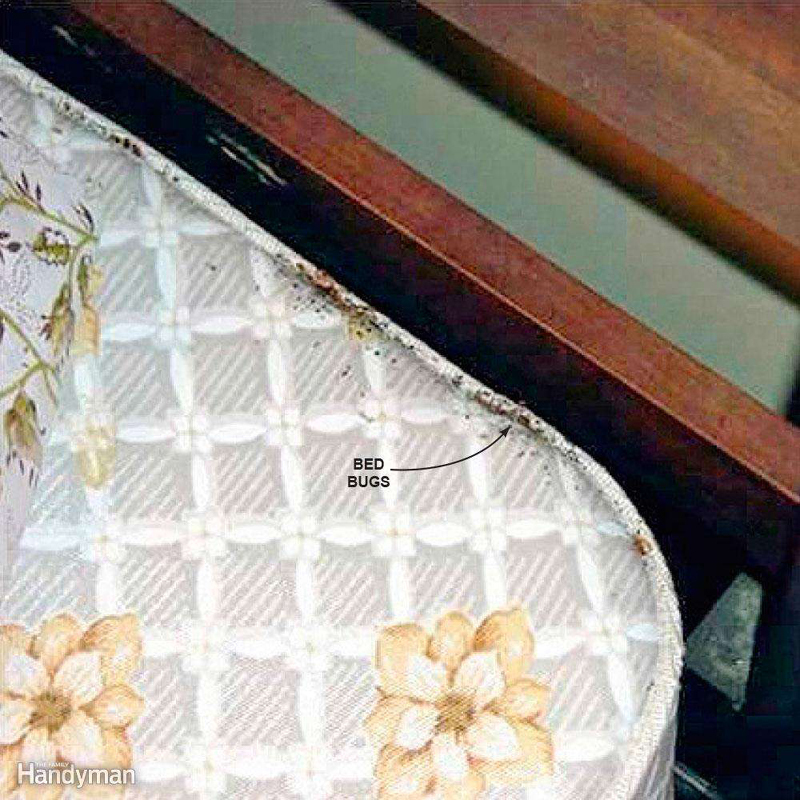 Flat surfaces can be wiped with alcohol or sprayed with a bed bug—killing contact pesticide, but all items that have a small nook or cranny where bed bugs could hide (which is most stuff) need to be treated with penetrating fumes. Build yourself a kill chamber out of a large storage bin. 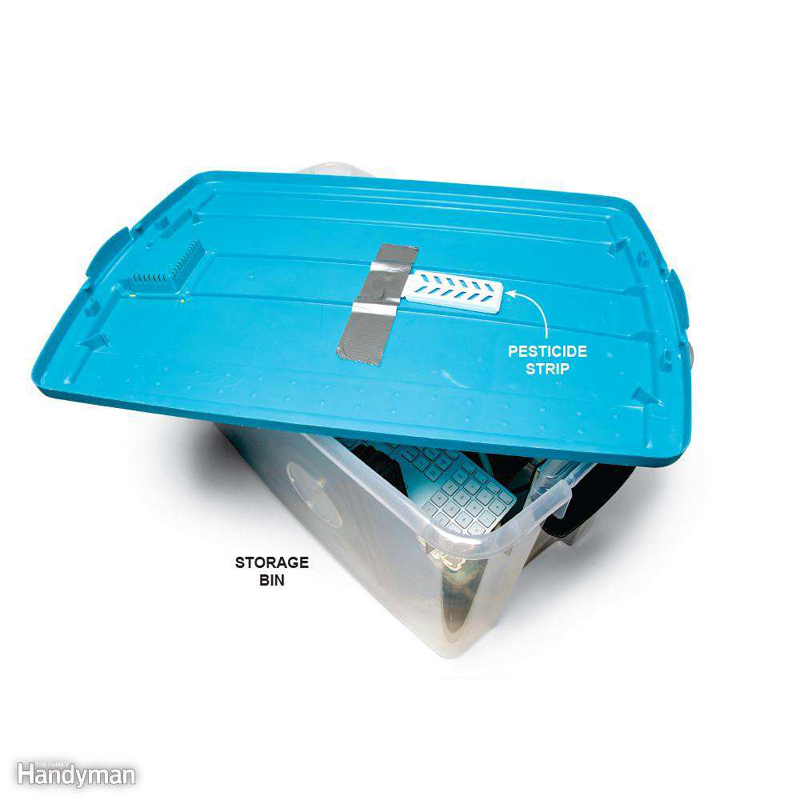 Tape a pesticide strip to the side or lid of the bin, and seal your stuff inside for a couple days or however long the manufacturer recommends. Seal the lid of the bin with duct tape. You can treat all your belongings by reusing the same bins; just make sure to keep your other stuff that's waiting to be treated bagged up in the meantime. Always wear gloves when handling pesticides and be sure to follow all safety instructions. The pesticide strips shown here are Nuvan ProStrips. 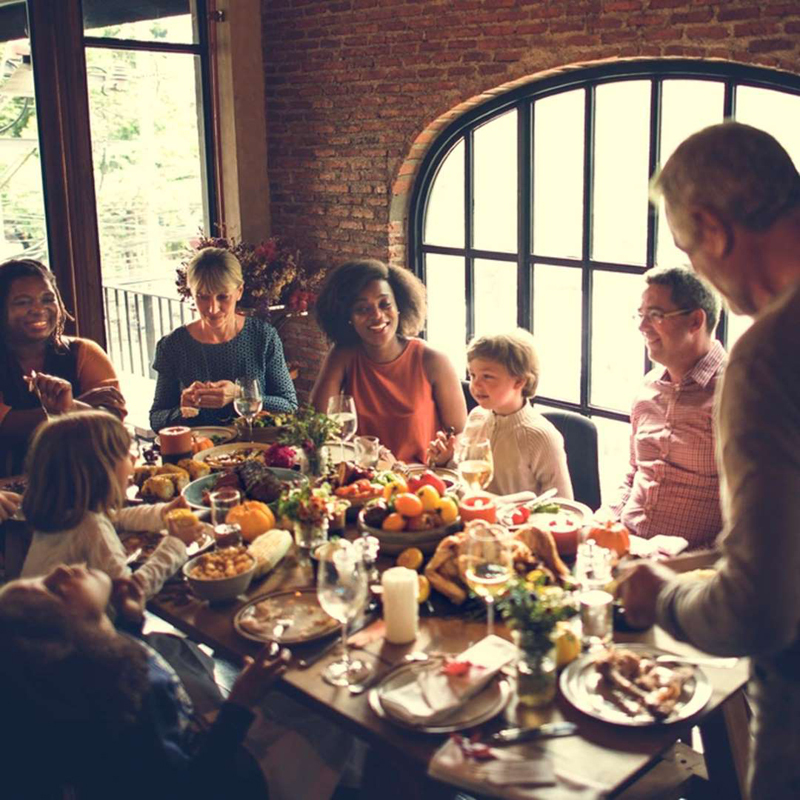 Telling Aunt Harriet not to come for Christmas is probably not going to work (though it might be worth a shot), but you can still boss your kids around. Send your kids off to college with the information they need to inspect for bed bugs in their dorm room. And include as a parting gift a package of a few detection traps. Instruct those returning scholars to bag up their mountains of dirty laundry and leave the bags in the garage until transporting them directly to the washing machine. Wash clothes in hot water and dry thoroughly. Insecticides are an effective way to eradicate bed bugs, but not the only way. If you or someone in your house is highly sensitive to chemicals, or you're just not crazy about the idea of spraying chemicals where you sleep, kill the little blood suckers with heat. Temperatures above 120 degrees F kill all stages of bed bugs. Steamers can be used to treat all the same areas where you would have sprayed contact killers. 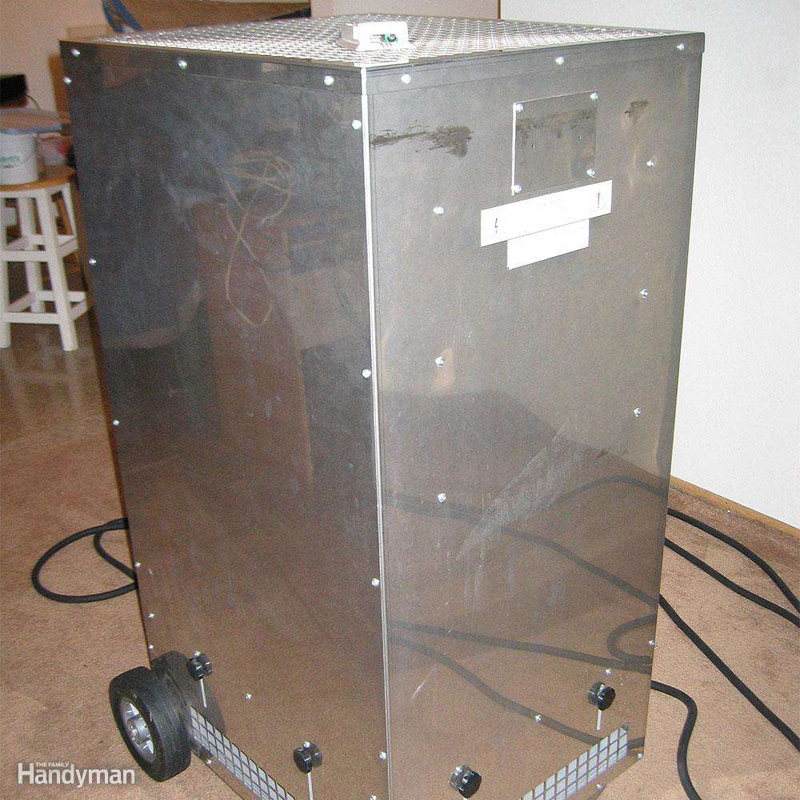 Steamers like the one shown at (top) cost about $150 and are good for many other projects like removing wallpaper, cleaning tile, removing labels, cleaning engine parts and removing wrinkles from fabric. 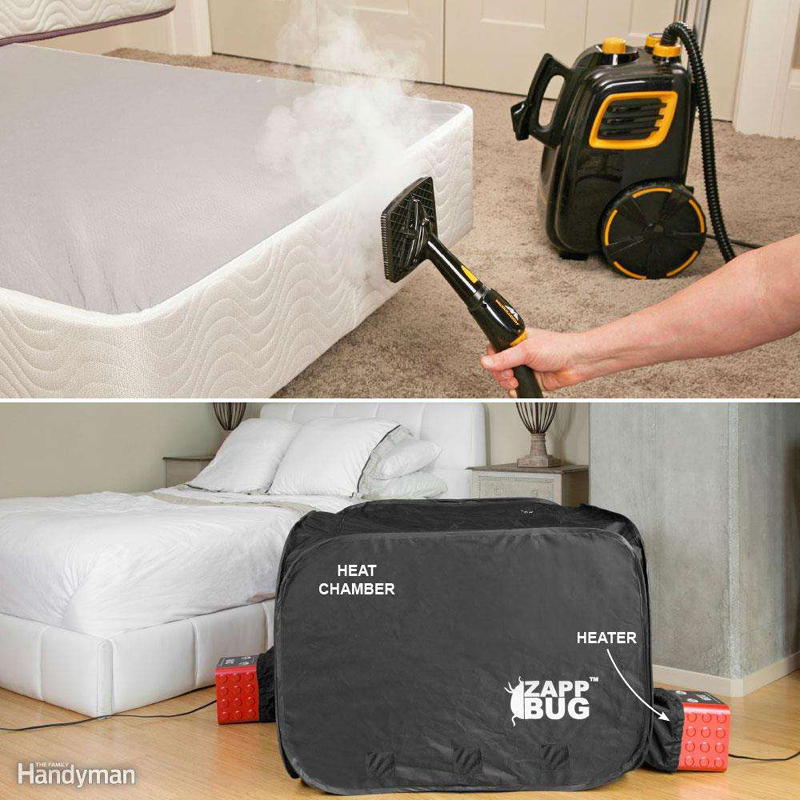 Heat chambers like this one (bottom) can be used to heat personal belongings and kill any hidden bed bugs without chemicals. They come in various sizes, and prices start at less than $200. In the summer, you could let Mother Nature do the dirty work. Bag up your belongings and set them on the driveway. On a day when the temp tops 95 degrees, a bag placed in the sun should easily reach 120 degrees F inside.